This Jumperoo's comfortable rotating seat is designed to provide a safe place for infants to play. 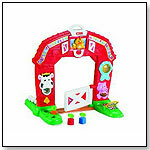 The colorful rainforest toys and lively music aim to stimulate visual and auditory senses and help develop motor skills. This activity gym is designed to stimulate babies with music, lights, nature sounds, games and textures. It features 20 minutes of parent-activated continuous music, and a baby mode with eight to 12 seconds of lights and music. Included are a floor quilt with silky borders and colorful arches, a spinner with rattling beads, spinning butterflies, a shiny mirror, a crinkly leaf and movable and stationary activity toys. The gym measures 20" x 32.5" x 32.5." This remote plays over 35 silly sounds and fun phrases as children press buttons just like those on a real remote. Fast forward and rewind sound effects and a real working volume control are included. Elmo’s eyes also open & close. — As of 7.26.2010, this product had 4 out of 5 stars from 72 reviews on Amazon.com, and was listed No. 22 in the top 100 best-selling toys and games. PROS: Humorous, durable and keeps children busy. CONS: Some parents did not feel it was educational enough. This interactive battery-powered gorilla walks on its two arms and makes stomping and roaring sounds when its button is pressed. The figure measures 7" x 6" x 8." Kids can unlock the adventure of this lost fantasy world with five activation points in all. When a boulder is placed in the dino’s mouth it rolls down the tunnel, and when the figure is turned in different directions, it can throw the boulder, stomp its feet and move its neck. This adorable dino is ready to steady baby’s first steps, encouraging progress with rewarding lights sounds, and upbeat music. Once walking is a sure thing, the dino’s legs lock together for use as a ride-on. Three AA batteries are included. This play set, designed to stimulate kids' imaginations, features a fantasy world in which robot police roam the streets. The police headquarters comes with a landing pad, jail, elevator, lights, sounds and more, and it even transforms into a robot. This Thomas the Tank Engine battery-powered ride-on features step-up sideboard footrests for easy on and off, push-button operation for simple stop and go, a contoured high-back seat for a secure and comfortable ride, and signature Thomas & Friends styling. It goes up to 2 mph on hard surfaces and grass and includes a 6-volt battery and charger. 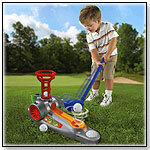 The Tornado Tee golf is a unique Golf sports item with an innovative feature. On pressing the activation button the golf ball is loaded onto the tee where it levitates in air for about 8 secs. The Tornado Tee makes it easy and fun for kids to hit the ball. Package includes: three balls, stationary tee for beginner or windy-day play and universal golf club for right- or left-handers. Requires six ”D” batteries. Launch date: 2009. 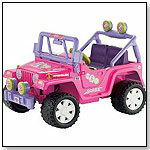 The Barbie Jammin' Jeep Wrangler features a real FM radio, working doors and a rear storage area. The jeep drives two speeds forward (2.5 & 5 mph max.) and one speed reverse on hard surfaces and grass and comes fully equipped with a high-speed lock out for beginners and Power Lock brakes. 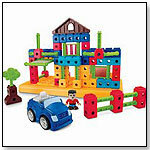 Easy-click bricks, sticks, panels, and a play figure make building a snap for kids. They can build suggested designs, or use their imagination to build things all their own. Includes 100 pieces in a convenient storage tub whose lid doubles as a building base. 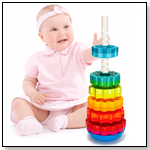 All pieces in the Fisher-Price TRIO Building System work together. Launch date: 2010. 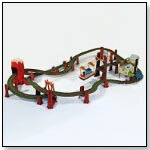 It features two destinations in one: Misty Island on one side and the Island of Sodor on the other for more fun, and on-the-go play. Boys can take Thomas through the two-leveled play on Misty Island and then send him wobbling over the Shake-Shake Bridge to return to the Island of Sodor. For the younger Thomas fan, this is a chunky Thomas engine and easy-to-use lantern. Kids can be the conductor as they lead Thomas wherever they want to go. Utilizing infrared technology, the Thomas engine reacts to the light of the lantern and follows along for endless fun. For extra play, boys can press one of three large buttons on the side of the lantern to activate pre-programmed moves including zigzags, figure eights and circles. 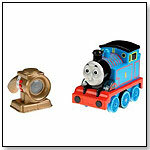 Fisher-Price teams up with Thomas & Friends, the world’s most popular preschool property, for a new collection of toys. 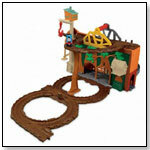 Straight out of the direct-to-home DVD release Misty Island Rescue, the Playset features a motorized Thomas engine and all-new action features including a thrilling, never-been-done-before zip line and motorized logging mill! 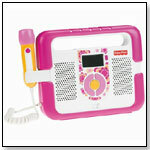 FISHER-PRICE’s Kid-Tough Music Player is, as its name suggests, a mp3 player designed to be kid-friendly and kid-tough. Able to survive drops, the player features large buttons, simple controls, and easy-to-use software. Available in pink or blue, the Kid-Tough Music Player can hold more than four hours of music and works with most digital music file types. Launch date: July 2010. FISHER-PRICE follows up its remote controlled Imaginext Spike the Ultra Dinosaur with the elusive yet irresistible Imaginext Bigfoot the Monster. 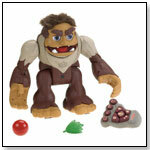 Kids command Bigfoot with a foot-shaped remote, making him walk, flip, and express emotions. With just the press of a button, Bigfoot roars, snores, talks, eats, works out, and throws his ball. Launch date: June 2010. — As of 1.07.2011 this product had 4.5 out of 5 stars on Target.com and was listed as one of the site's bestsellers. Pros: Durable; Interactive; Entertaining. Cartoon star. Theme park mascot. Worldwide icon. Dance star? 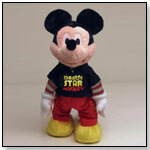 Mickey Mouse takes on a new role with FISHER-PRICE’s new Dance Star Mickey Mouse. The interactive toy is quite an accomplished dancer, able to switch between Soul, Techno, Disco, and Latin dancing styles. Interactive activities, walking, and talking are also a part of this playful rodent’s repertoire. — As of 1.07.2011 this product had 5 out of 5 stars on Walmart.com and was the #12 bestselling item in the Dolls & Dollhouses category. Pros: Multiple songs; interactive. Cons: Possibly too fragile for very young children. From the day the baby crawls through the archway to when she's walking up to it, there are plenty of activities. Shapes and objects can be counted, sorted, flipped and spun. Many activities trigger sing-along songs, lights, sounds and phrases. It requires 3 AA batteries and is suitable for ages 6 months and up. A favorite childhood character, Dora the Explorer is an adventurous little girl who loves to explore and learn. In this interactive toy, Dora wears a jacket with patches from four countries around the world that she visits in the television show. Upon pressing each patch, children can learn the words for “hello” and “goodbye” in the language for each country. 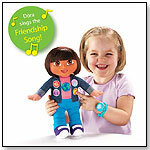 Dora also speaks other phrases in English and Spanish, and sings the Friendship Song. Included are four collectible friendship bracelets from each country. — “Dora the Explorer … even beats out Elmo,” remarked Tracie Meadows, owner of Whippersnappers in St. Simon's Island, Ga., of her best-selling licensed toy in April 2009. Suitable for ages 18 months and up, this product features Elmo, Grover, Oscar and Cookie Monster cooking up some fun. Sound effects, a spinning turntable and lights add to the experience. When kids put the five included play food items into the microwave, they change and come out “cooked.” It comes with 3 AA batteries. Launch date: June 2009. Elmo loves dancing and tickling. With Elmo Tickle Hands, children wear soft, furry red gloves with Elmo's face on them. When they touch objects, they hear silly sound effects and Elmo saying several phrases and laughing. If they tickle, Elmo cracks up even more. A dance mode is activated by touching Elmo's nose. Motion sensors allow Elmo to guide kids through his latest dance. This product is suitable for ages 18 months and up. Launch date: August 2009. Suitable for ages 18 months and up, this toy builds on the success of the 2008 Elmo Live. The encore version has new jokes, a new story and more interactive features. It will also sing the Sesame Street theme song “Sunny Days,” as well as “Somebody Come and Play” and “Elmo's World.” Launch date: October 2009.